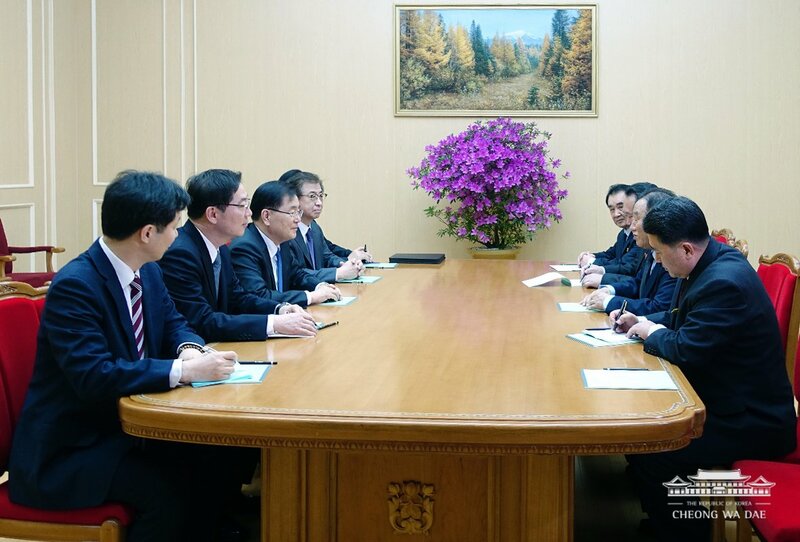 Members of a South Korean special delegation to Pyongyang met with DPRK leader Kim Jong Un on Monday evening, the ROK presidential office announced. 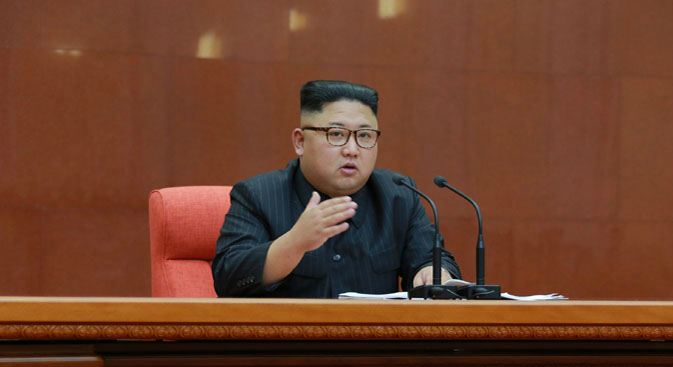 The meeting represents the first time the North Korean Supreme Leader has met with South Korean government officials, and reportedly involves a reception followed by a banquet. The 10-member special delegation, led by Chief of the National Security Office (NSO) Chung Eui-yong, departed for Pyongyang on Monday at 1350 Seoul time. The flight arrived at 1450 Seoul time (1420 local time) at Pyongyang’s Sunan International Airport. 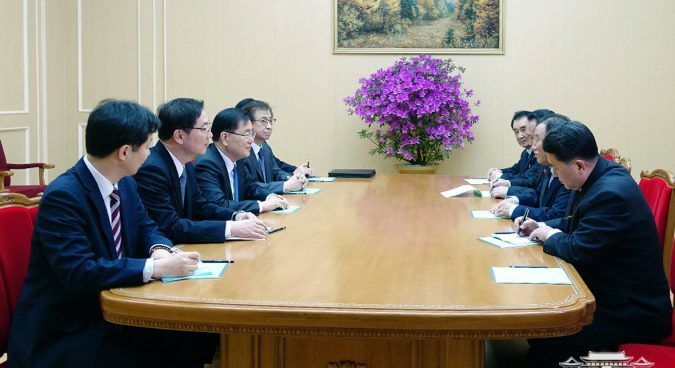 Accompanying Chung is Director of the National Intelligence Service (NIS) Suh Hoon and vice unification minister Chun Hae-sung, as well as second deputy director of the NIS Kim Sang-gyun and Yun Kun-young, a senior Blue House official in charge of monitoring state affairs. Five members of staff are also with the delegation. Chairman of the DPRK’s Committee for the Peaceful Reunification of the Country (CPRC) Ri Son Gwon and deputy director of the United Front Department of the Central Committee of the Workers’ Party of Korea (WPK) Maeng Kyong Il met the delegation at the airport. Ri, Maeng, and the South Korean special envoys then held a 10-minute conversation in the airport’s VIP area. 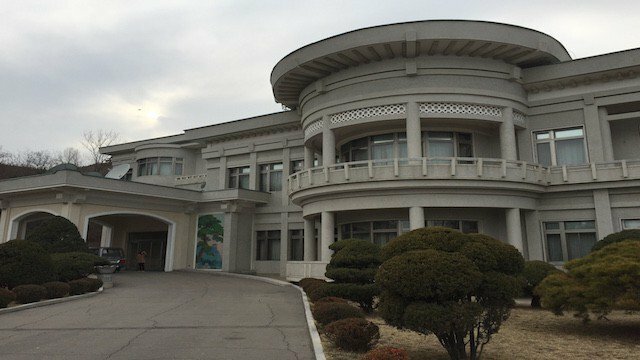 The ROK special delegation then moved to the Kobangsan Guest House, where they were welcomed by Kim Yong Chol, who serves as director of the United Front Department of the WPK Central Committee and vice-chairman of the WPK Central Committee and who they met in the South last month. Officials from the two Koreas then agreed the South Korean delegation would hold a meeting with Kim Jong Un. 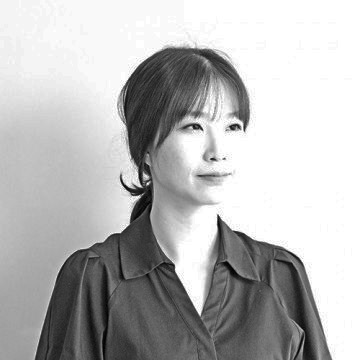 “[Both] agreed to proceed with a reception and a banquet with chairman of the State Affairs Commission Kim Jong-un from 06:00 pm,” Blue House spokesperson Kim Eui-kyeom told media during a news briefing in Seoul. Details of the landmark inter-Korean meeting are reaching Seoul via fax and email, South Korea’s Yonhap News Agency reported. “The special delegation said it had judged that the North Korean side has been preparing a lot for warmly welcoming the South Korean delegation,” Kim said, citing the composition of the officials greeting them, as well as the accommodation and security reportedly provided to the South Koreans. The DPRK’s state-run media Korean Central News Agency (KCNA) on Monday also reported the arrival of the South Korean special envoys. “A delegation of special envoy of the south Korean president, including Jong Ui Yong, chief of the State Security Office of Chongwadae, arrived here Monday,” KCNA said in an English-language dispatch. Ahead of the visit, NSO chief Chung told a news conference in Seoul that the purpose of his and the delegation’s visit would be to press North Korean officials on denuclearization and encourage them to engage in dialogue with the U.S.
“More than anything, we will clearly deliver the President’s firm will to achieve the denuclearization on the Korean peninsula and create sincere and permanent peace,” Chung told media. The South Korean presidential office on Sunday said the special delegation would hold “comprehensive” discussions with the North Koreans. The special delegation will return to the South on Tuesday afternoon, before heading to the U.S. to discuss the DPRK visit with U.S. officials.